Q / Tell us about Liubov Egorova as a person. R / We would refer to her as "Madame". Liubov Egorova inspired such respect that we scarcely chatted after class. She was a master. A master, indeed, but a very loving one, who radiated warmth and generosity. Madame Egorova impressed one with a natural authority. Never did she raise her voice, nor ever shout. One sensed the great sum of her experience. Nor did she put on airs to play the grand lady, the Princess. Prince Troubetzkoï, her husband, grew herb plants, and one would sometimes see her in the kitchen, cutting and chopping with chapped hands. Many years went by before she invited me up to the tiny apartment she had above the studio, and where she doubtless lived weekdays. At Clamart, she spent the week-ends with her husband - and their dog Trott - at their little cottage. On one occasion alone did I ever hear her say something personal. It was during a private lesson. A faint melancholy smile flitted over her face, and she said "how life has flown – a dream". Whatever the case, she succeeded in passing on that dream on to her students. Liubov Egorova was both a solitary being, and very open to others. Individuals of her moral constitution live for a truth that they can not betray. They will face down any peril, in order to pass it on. In her studio rue de la Rochefoucauld, Madame Egorova kept a fire in the hearth, because it was generally chilly. I see her now, sitting on a little white stool. Beaming, her smile always made one feel very welcome. Madame Egorova spoke little during class, and we hung on every word. From the white stool, she would demonstrate with her hands. Vis-à-vis the pianist, her attitude was quite different from other teachers who first show and then expect the pianist to concoct something for the steps. With Egorova, it was the other way round. After the barre, she would ask the pianist to play an adage and then listen, eyes closed intently to the sounds from which she drew all inspiration. She would then start inventing, while marking with her hands. Then she would stand and show us the adage. Q / You were introduced to her as a child? R / Yes, I started dancing at the age of five, and by age six, I was on stage with Les Ballets de la Jeunesse at Salle Pleyel – Georges Skibine, Youri Algaroff were members too. 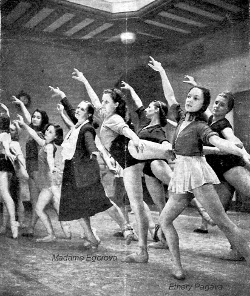 Madame Egorova was responsible for the choreography. At eleven I was a soloist with Les Ballets de Roland Petit and at fifteen, étoile with Les Ballets du Marquis de Cuevas. Nevertheless, I would always return to work with Madame Egorova, twenty-five years in all, because to me she was, and remains, the essence of the dance. Egorova never attempted to control people: she was quite above that, generosity itself. Never would she discourage a student from studying elsewhere. Q / What was her class like ? R / Madame Egorova always gave more or less the same, simple barre, but paid the greatest attention to placement. There she had us work the muscles very gradually, through exercises alternately quickly or slow, and required precise épaulements; these became second nature, with each part being independent but well-coordinated with the rest. The turnout being a movement from the hip-joint, and not from the foot, Madame Egorova took especial care not to promote a fake turnout. Peculiar to her teaching is that with beginners, she preferred to have the supporting column, the standing leg, be well-turned out from the hip, and ideally placed relative to the line of aplomb. Little by little, the gesture leg would "learn" to turn in relation to the firmly-held column. The same applied to the fifth position: she objected to the over-crossed fifth, which is so ugly, and which does not exist in the human body. She taught a fifth that closes against the big toe (so-called Cecchetti fifth). To acquire it, the student was to place the standing leg properly, firmly held by the little-toe side of the foot, nicely fanned out on the ground, and little by little, the front leg would come to place itself correctly next the back leg. Egorova’s work was beautiful, because there were no contractions, no application of force. One should stress that her knowledge of anatomy was thorough. Madame Egorova often referred to the line of aplomb, that one was to sense as a perpendicular straight down through the centre of the body. In placing his hand on the barre, the dancer was first to imagine both arms opening à la seconde relative to the central axis: as the barre-side arm is lowered onto the barre, it remains supported as though it were still à la seconde. Later, in pas de deux, a dancer who is truly on her axis will not have to lean on her partner as though he were a crutch. Egorova always strove to make us aware of how the spinal column was placed. Immediately after the barre, Madame Egorova would give an adage in the middle, a long and splendid one, very lyrical, that we were to memorise. The adage would be repeated four times, twice to the left and twice to the right. Much of it would be en relevé, to test whether the body were held on its axis. On occasion, she would return to an adage that she had given a fortnight or so earlier, and expect us to recall it! The idea was to avoid our sliding into a rut and prepare us for life on stage. Her first priority though, was to make us listen to the music, in order that we express not merely rhythm and melody, but the essence of its emotion. These long enchaînements made memorising quite natural to us, and dancing, still more natural. Madame Egorova laid the groundwork, but above all, she invited us to dance. After the adage she invariably gave grandes pirouettes. We were expected to "snap out" of the adage in a twinkling, and transform ourselves from the intense lyricism in the adage, to rigorous precision. The grandes pirouettes she gave were most difficult. The youngsters would only perform them à la seconde, while the older students would come across within enchaînements. Then she would give little jumps, very precise too, but always with the correct épaulements, even with rank beginners. Then came petit allegro, again with the épaulements, and this was a real little dance! In the series of neat quick steps, the arm-rhythm was to be the same as the feet. Then Egorova gave petite batterie, with the épaulements. Not a step in the vocabulary was left out, every single type of brisé, including en tournant. Contrary to the teaching method still habitual in France today, Madame Egorova did not give séries. Like Bournonville, she would spring difficulties on us, that she had "winkled away" within an enchaînement. Since difficulties on stage invariably arise in unexpected configurations, the sooner one became acquainted with the problem, the better! Then came the big jumps and grande batterie, including for women. Just as for pointe work, when the dancer takes to the airs, the torso must work very hard to lighten the load on the legs. Egorova’s grand allegro was so long as to be almost a variation. Then there was a temps de valse. Now the girls would put on their pointe shoes ; of course we performed the échappés, relevés, pirouettes, but always with the épaulements - not baldly en face. Madame Egorova would give many relevés en arabesque, as one sees in Les Sylphides. She would then give a variation sur les pointes with renversés, that were extremely difficult. In the lyrical enchaînements, the timing of the arms was to be slightly behind the legs, because the arms represented the melody. She would then give fouettés or a manège, where we were to "float" or "hover" over the ground, rather than turning it into a smashing performance. The men would then perform pas de virtuosité. The class ended with relevé entrechat six, grands battements and révérence. We learnt how to move through space, the torso always preceding the leg-movements. She would say "One must both start, and finish, properly". And so the end of the class called for great concentration. At the very end, she would often give a fragment from a variation, followed by another fragment the next day, and so on until we had learnt the entire variation. Little by little, she was acquainting us with the repertory! Madame Egorova declined to teach in a crowded class. In order to work as she saw fit, she selected her students, and everyone had his place. Q / And what about the hands? R / To Egorova, the hands were essential, if one were to properly place the entire arm and thus the body. When I danced with Rosella Hightower at London, Rosella, by then a major étoile, most particularly asked me to show her what Madame Egorova had taught us about the hands and arms. To Madame Egorova, the hand deserves as much attention as the foot. And the body must react with the same intelligence, as the head. As for the head, the sightline was not to be "fixed" straight ahead, but rather slightly lifted towards the first balcony in the theatre. The port de tête is thus "raised" as it were. This is not well-explained at present. Egorova would say that the torso is the melody and the lower body the motor, but if the motor is poorly-placed, the melody will not be heard. Q / What was her approach to pointe work ? R / Egorova wanted us to realise that the foot stretches and arches because it takes its orders from the leg. In battement dégagé, she insisted that we go through the entire foot, from pointe tendue to demi-pointe to flat foot, without fudging any stage along the way. There was no such thing as pushing into a fake "high arch"! In terms of how she taught pointe work, unless the choreography specifically called for it, she did not teach Cecchetti’s method of the tiny jump to place the foot on pointe under the line of aplomb. She wanted us to work through the entire foot. We were expected to be so "lifted" in the body, raised so high over the ground, that the pointe would as though scarcely touch the ground – rather than being stabbed into it. The ankle is thus a mere extension of the leg and never "curled over". Nor would Madame Egorova tolerate anyone going over the shoe. At present, in order to get the fashionable "high arch" look, teachers have students press forward over the shoe. This drives the foot into the floor, distorts the leg’s proper alignment and puts the Achilles tendon under the most harmful strain. Not to speak of damage to the bone structure! 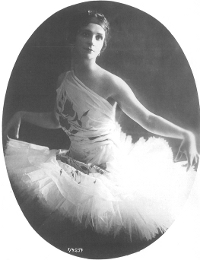 Whereas Madame Egorova’s method lent pointe work an impalpable lightness. 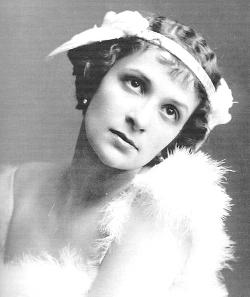 Egorova got along very well with the men, and had special exercises for them: René Bon, Pierre Lacotte, Skibine, Algaroff, Lifar, people from the Opéra (they were used to take class with outside teachers then). Speaking of the Opéra, the étoile Solange Schwarz was in class almost every morning. 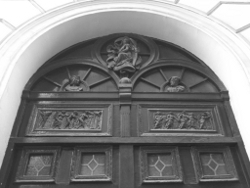 Q / How could those men, who were virtuosi, work in such a tiny space ? R / Egorova was the master of space ! She would say "dance big, as though you were stepping over a puddle of water on the ground". And somehow, we managed to go from "dancing big » in that cramped little studio to holding our own on the world’s vast stages. Because with Egorova, the body always precedes the legs and feet. And that too is the secret behind jumping. Q / Music was everything to her? R / Since very early days, Madame Egorova made it plain that each and every movement must express what the music has made us feel. The linking steps - temps de liaison – were very important, in order to underline – or on occasion, deliberately blur ! – what was to follow. To lend the next step a high relief – or a very low relief. Madame Egorova taught us how to gauge the intensity. Why should every step have the same intensity, the same weight, as the next? Dancing is a language, and the artist himself is at liberty to stress this or that part of speech, rather than another. Egorova would only hire pianists who were both true musicians, and played admirably. She did not give counts, and we were told not to count – though we were expected to be perfectly precise. Because for Madame Egorova classical dancing is a theatrical art form, in other words, an art of expression. One has to have danced, to teach. We could see that the music lived in her. When she would stand up to demonstrate, it was all there, in her hands, inspired, enthralling. 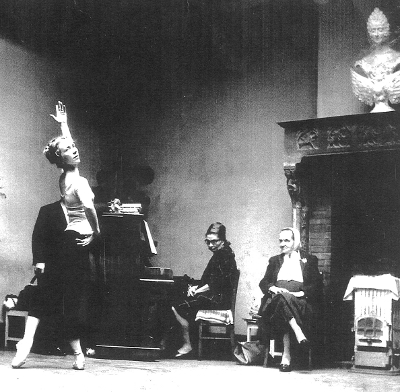 Q / How did Madame Egorova teach the plié ? R / The plié was a great cause for Madame Egorova. As though walking on eggs, the plié had to go through stages. No squatting at the bottom of a plié, waiting for– What? She insisted on that control, which is what lends the dance its moelleux. Then of course there is another, crisper plié, which serves a different purpose. Mastery of the plié protects the Achilles tendon as well. The feeling in the body that Madame Egorova strove to inculcate was that the body "floats above", it is "over". Q / What was the atmosphere like? R / I recall it as though it were yesterday! Priceless, such great joy ! And I was not alone – everyone felt that! We are orphans now! This is the world that we must bring back to life for the next generation. I’ve come to believe that we must give series of classes – according to Egorova, according to Preobrajenskaya, and so forth for the other great masters – in order that our youth become acquainted with all this. If we wish to train human beings who dance, rather than machines, we cannot allow these methods to vanish. World-famous artists came from afar to work with Madame Egorova. But she would never push them up front. In her studio, the dancers were accomplices, not rivals, and it was friendship that bound us together. She taught us to work together, to commune, and to put self aside before what reigns above us, we who are merely the instrument. Madame Egorova gave me a little duvet when my son was born. We have kept it always. Perhaps she saw me as a daughter. She gave me a cross, that I have kept as well. An artist may sometimes be accomplished in his work, but not in life. Madame Egorova was a human being as accomplished in life as in art. That is the hardest of all, and that is why our respect for her was so great. It is the case for all beloved beings, that once the physical presence, mortal existence, is no more, there is another presence that may perhaps be more important still, and which will never die. I burn with eagerness to give a class in her honour, because it must go on.